The book is now published! The book is also part of our apprenticeship. Part of the content, as well as, new content is in a separate document called Addendum. Click here to download the addendum. The book is available on the Wiley website. Also, read our article on strong correlations to see how various sections of our book apply to modern data science. Most recently, Vincent launched Data Science Central, the leading social network for big data, business analytics and data science practitioners. 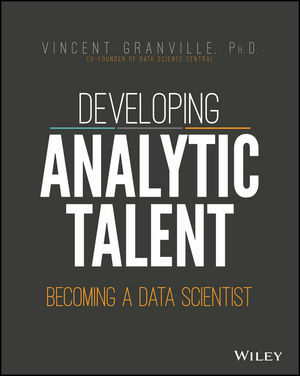 Vincent is a former post-doctorate of Cambridge University and the National Institute of Statistical Sciences. He was among the finalists at the Wharton School Business Plan Competition and at the Belgian Mathematical Olympiads. Vincent has published 40 papers in statistical journals (including Journal of Royal Statistical Society – Series B, IEEE Pattern Analysis and Machine Intelligence, Journal of Number Theory), a Wiley book on data science, and is an invited speaker at international conferences. He also developed a new data mining technology known as hidden decision trees, owns multiple patents, published the first data science eBook, and raised $6MM in start-up funding. Vincent is a top 20 big data influencers according to Forbes, and was also featured on CNN. READ GREAT REVIEWS of Vincent’s Book Here.